How do I love the weekend? Let me count the ways. One! A Saturday morning run with Amy (4.22 miles at a nine minute pace!) followed by shared errands as we prepared for the evening's literary reading at the yoga studio. After treating ourselves to post-run soy lattes, we picked up 60 rental chairs and shopped for refreshments before parting ways. I went home, showered, had lunch, and then spent the rest of the afternoon working on a short story, which I was planning to read at the event. I'd been working on this particular story on and off for months, and had a breakthrough at the last possible moment. I switched the narrative from first person to third, and it made all the difference! The story is not perfect, but I've found you can get away with more when reading something out loud. The story still has a way to go before it can join the slush pile. The public begins to arrive. Two! The Bi-Monthly Literary Reading at the Yoga Studio. This was our fourth event, and it does not appear to be losing an ounce of steam. 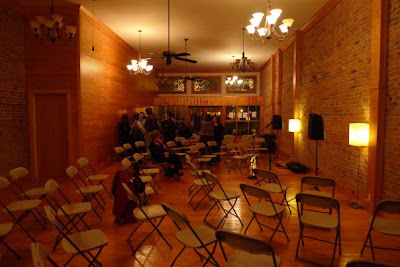 We had eight readers this time around, which is the perfect number, and filled every seat in the house and then some. We also collected donations for both the Red Cross and the Animal Shelter and raised a fair amount of cash. I wasn't planning to read this time around but since someone had to back out a week ago, I figured it was only fair. 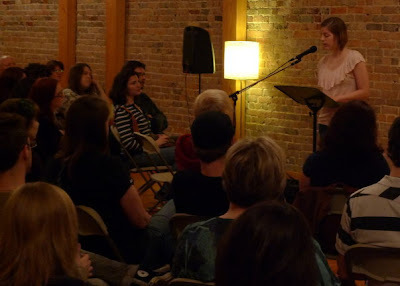 The reading series is getting so popular that by the end of the night, I had been approached by about 20 people (no joke) who wanted to sign up to read at the April event. Insane! I hate to turn people away, but 20 is really too many. I plan to give first dibs to anyone who has not read before, and then doing a first come, first serve kind of thing. As this is a good problem to have, I am definitely not complaining! That right there is why I love organizing these readings, and why I'm glad they've been such a success. Three! In addition to warm fuzzies via Facebook, Sunday was also awesome because it was 65 degrees and sunny! Team Pink Whiskey (Nathan, Amy and I) celebrated the good weather by going for a 7 mile run. Yes, that is two runs in two days, and it felt awesome. My current running goal is SPEED, and running with people faster than me is the way to accomplish that goal. Our 7 miles was completed in an overall pace of 9:21 minute miles, which pleased me. To run a sub 2 hour half marathon, I will have to run at a 9:05 minute pace. I am on track! After our run, Nathan and I headed to Lufkin. I needed a racing swimsuit and was glad to find one at Academy. It is appropriately sporty. Unfortunately, I have to wait a whole week to break it in, because - very fortunately - I am leaving tomorrow for the WebWise conference in Denver. I'm super excited about the trip - WebWise is an amazing conference, this will be my first time visiting Colorado, and a week out of the office, learning and being motivated, is always exciting. Look forward to lots of foodie posts when I get back, and a few sporadic updates while I'm away. And, most of all, have a great week!